As of January 1, 2019 - Holy Cross is searching for a Rector. We are looking for a full time Rector. The compensation package is negotiable. Holy Cross has a total of 58 members in good standing with an average Sunday attendance of 21. We have 24 pledging units which includes one unit that consists of interest earned from our two endowments, one restricted and one unrestricted. All administrative and clerical services are performed by volunteers of which we have an abundance! We share our building with the Dells-Delton United Methodist Church. The two parishes have created a Corporation to own, run and maintain the building with a Board made up of members from each parish. We share a campus with the Dells-Delton United Methodist Church and are part of an active vacation/resort community that offers both excitement and solitude. 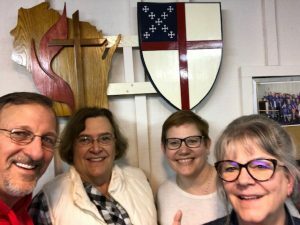 In 1970, Holy Cross Episcopal Church, Lake Delton and St. Paul's Episcopal Church, Wisconsin Dells combined to form Holy Cross Episcopal Church. We then partnered with the United Methodist Church to build one worship space for both parishes to share. In 1972, the building was finished and consecrated.